The Device under test cathode, anode and gate are connected to the unit’s CATHODE, ANODE and GATE terminals, respectively. Pressing switch S1 feeds a gate current to the DUT (Device Under Test), which triggers it on. 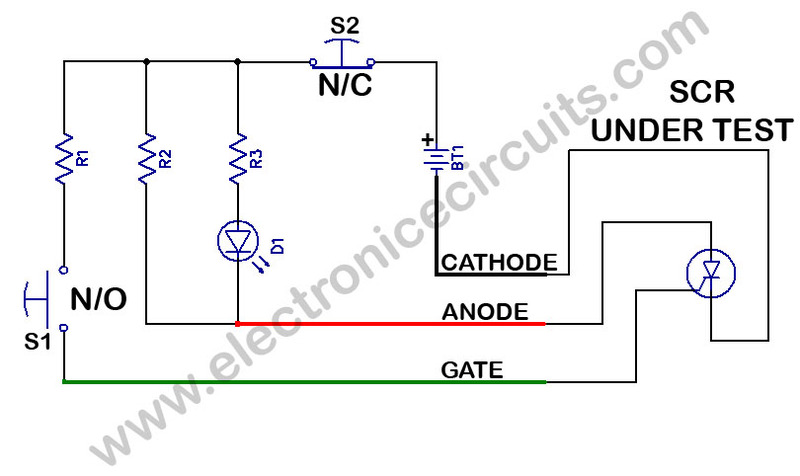 Resistor R1 limits the gate current to the appropriate level. Resistor R3 limits the current through the LED to about 20 mA which, with the current through R2, results in a latching current of about 110 mA. The LED is used to monitor the latching current. IF the DUT is good, once the gate is triggered with S1, the LED will remain light, indicating that the device is conducting. To end the test, turn off the device by interrupting the latching current flow using switch S2. The LED should turn off and remain off. The preceding procedure will work SCRs and Triacs. To check LED and other diodes, connect the anode and cathode leads to the anode and cathode of the diode; LED should light. When the leads are reversed, the LED1 should remain off. Thanks so much for writing all of the excellent info! I am looking forward to seeintg more posts. Very educating write up, bookmarked the blog for interest to see more! The nice post helped me very much! Saved your website, extremely great categories everywhere that I read here! I really appreciate the info, thanks. Helpful blog, bookmarked your blog with interest to read more information! This has been good quality information and facts you presented relating to this subject. I don’t agree with every thing, nevertheless, you absolutely produced some good points. Очень хорошая и практическая схема. СПАСИБО!.